SW-MOTECH QUICK-LOCK Type 160 EVO Tank Bag Bottom Ring is used in conjunction with SW-MOTECH Quick-Lock EVO tank bags. 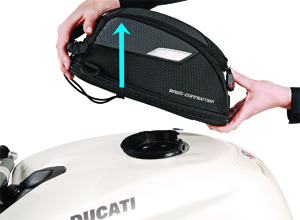 The SW-MOTECH QUICK-LOCK tankbag system enables a tankbag to be mounted or removed easily without the use of straps or magnets that may damage your motorcycle's finish. 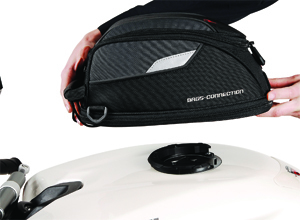 The system includes the tankbag, upper tankring and a separately available tankring that is designed to be installed onto the motorcycle. 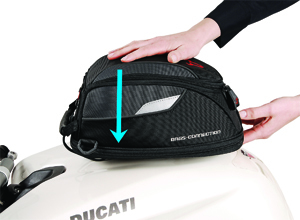 Once the system is assembled, the tankbag can be snapped securely into place or removed by pulling a release lanyard at the front of the tankbag. 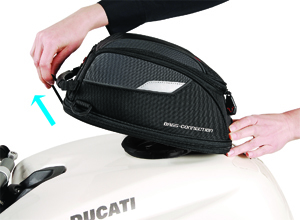 Once you have installed the Tankring, attaching your tankbag is easy! Step 1: Position tankbag directly over tankring. Step 2: Press down on tankbag, locking it into position. Detach the tankbag with one hand in one second! Step 1: Pull cord to release locking mechanism. Step 2: Lift bag up. Please verify before ordering: If your gas cap has 7 screws order the Type 135 ring. If your gas cap has 5 screws, order the Type 140 ring. Some ZX14s have holes without any threading and require two extra nylocks to attach the ring. If you're attaching a tank ring to this bike, let us know and we'll send you the extra Nylocks! ³ May fit additional Victory model years; we have not tested compatibility. Not compatible with most Victory Arlen Ness models, as the handlebars on those models do not provide enough clearance for installation of a tank bag or accessory mount on the tank ring. Note: If you already own an SW-MOTECH tankring or tankbag please ensure it is an EVO style ring prior to making this purchase. The EVO and ION style rings are incompatible and cannot be combined.